HCQ Series Grinding Mill is a newly designed and developed mill, with more advanced technology than R Series Roller Mill. 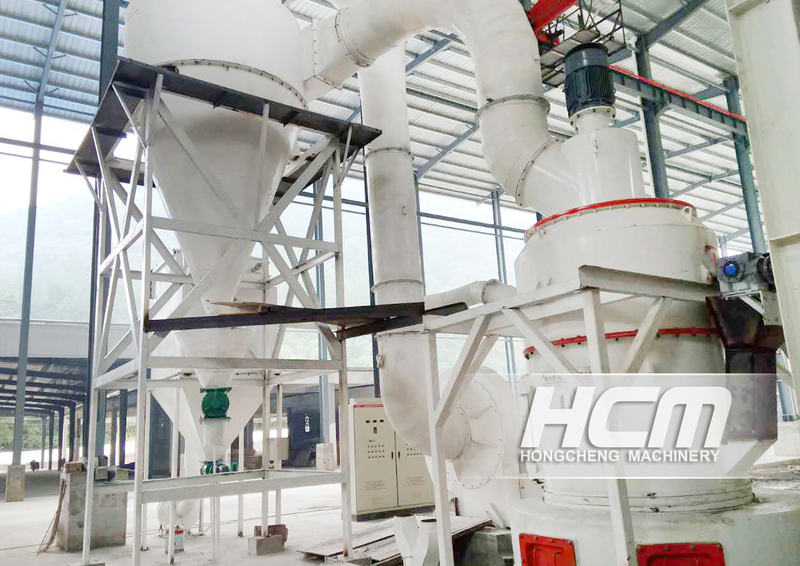 HCQ Series Grinding Mill has more scientific and reasonable configuration on main mill, classifier, blower, pipe system and feeder, all these largely increase the overall performance of the facility. Raw material is firstly broken by jaw crusher into required particle size, which are carried by bucket elevator up to the storage hopper. The vibration feeder then conveys the crushed materials at a fixed rate into the grinding chamber of the main unit for pulverizing. The three rollers hung upon the spider-arm are running around the shaft. With the centrifugal force, the four rotational rollers will go around the ring tightly. The raw materials is put up between the rollers and rings by the blade to make the raw materials into powder. 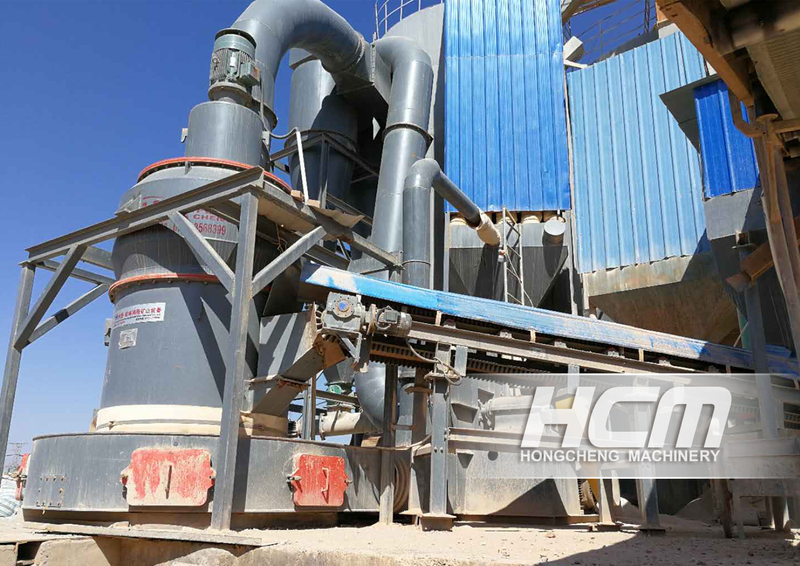 The grinded materials is blown up to the classifier, through which the powder is separated by the airflow. Coarse particles fall back down to the mill for regrinding. The needed particles will go into the collector where products will be removed through the discharge opening. The purified air flows to the air blower through the pipe above big cyclone collector. Air flue is circular type. Air stream in all pipelines is negative pressure except for that in the air blower and grinding chamber, which improved the working condition in the workshop. Wind volume in air flue increases as the moisture in material changes into vapour leaking in from the flange conjunctions and feed opening. Added air volume is transporting through the air blower and after-wind pipe, to simple collector. The end powder enters the collector with air stream and discharged from discharge valve. HCQ-Series Grinding Mill is applied in mineral grinding processing of metallurgy, construction material, chemical industry and mine fields. 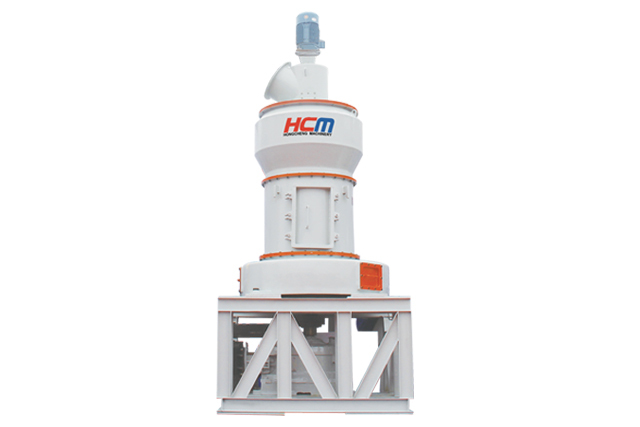 HCQ-series Grinding Mill is widely used to grind any non-metallic minerals with Mohs hardness below 7 and moisture below 6%, such as limestone, calcite, activated carbon, talc, dolomite, titanium dioxide, quartz, bauxite, marble, feldspar, barite, fluorite, gypsum, titanium iron ore, ilmenite, phosphorite, clay, argil, graphite, kaolin, diabase, gangue, wollastonite, quick lime, silicon carbide, bentonite, manganese. The fineness can be adjusted from 0.18mm(80 mesh) to 0.038mm(400 mesh), whose range is much wider than that of traditional raymond mill. 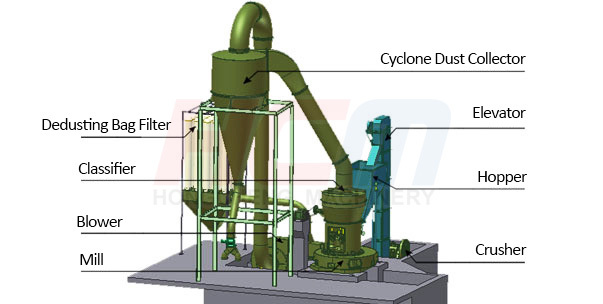 HCQ Series Grinding Mill consists of main mill, classifier, pipe system, blower, cyclone collector, base, central shaft support, ring, spider-arm, roller assembly, shaft, lifter support, lifter support base, electromagnetic-vibrating feeder and electronic control system. The ring and roller are made from wear-resistant material, whose surface is also given wear-resistant treatment. For the driving system, there are reducer and double-motor system for option. The classifying system uses the turbine classifier. Various feeding and conveying system can be done separately according to different material. The close system with cyclone plus pulse-jet collector and the open system with only pulse-jet collector are available for collecting system. As to the control system, you can select auto control or remote control. Note:The capacity is for limestone. 1. The grinding mill is in stereo-chemical structure, consume small floor space.the equipment has strong systematic because it can organize an independent and complete production system of raw material crushing, transporting, grinding to production collecting, storing and packing. 2. Applied high quality thicken steel to produce important parts, applied high performance wear-resistant material to produce wear-resistant parts. The equipment has high wear-resisting property and reliable operation. 3. The electric system is applied with centralized control, which will offer unmanned workshop operating and convenient maintenance. 4. Pulse dust collector can be equipped according to customer requirement, dust collecting efficiency can reach 99.9%, which is high efficiency and environmentally friendly. 5. Maintenance-free roller assembly and new spider-arm structure ensures the reliable performance and easy maintenance. 6. High capacity: system upgrading and reasonable solution guarantee higher production capacity. 7. Highly-precise classifying: the turbine classifier can achieve a fineness ranging from 80 mesh to 400 mesh. 8. Large air conveying capacity: centrifugal fan with high pressure and air volumn is used to improve the air conveying capacity. 9. Larger lifting capacity: newly-designed and super large lifter can convey more raw materials between ring and roller.